I have just finished The Swerve, by Harvard professor Stephen Greenblatt. It was recommended to me by (shameless plug coming up) my dazzlingly bright 18-year-old grandson, who has studied Latin for seven years and is an avid reader. I have to say this is one of the best nonfiction books I have ever read. Thank you, Josh! Greenblatt’s style is completely accessible, entertaining and fascinating. The briefest way to describe the book is that in the early 15th century, a papal scribe (there were three, count them, three, men claiming to be pope at this time) named Poggio Bracciolini, was obsessed with finding long lost Greek and Roman manuscripts and copying them in his meticulously beautiful handwriting to preserve them for posterity. He was looking particularly for Lucretius’ On the Nature of Things (De rerum natura), and serendipitously found it stowed away, ignored, in a German monastery in 1417. Because of the rediscovery of Lucretius’ poem, the world swerved in a very different direction from where it was and where it had been heading: Lucretius posited that everything in the universe is made of atoms colliding randomly; that humankind has free will, that there is no life after death, that the goal of life should be pleasure, and many other ideas that foretold the Renaissance, the Enlightenment and Darwin’s thinking, as well as that of modern liberal-minded writers (e.g., Christopher Hitchens and Richard Dawkins). 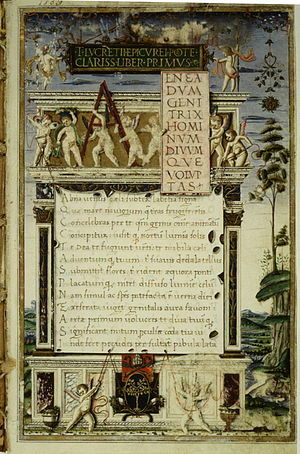 Remember, Lucretius conceived of these ideas 1,400 years before Poggio rediscovered him. This book is far from dry; in fact, it is a page-turner. Greenblatt vividly paints what life was like in Roman times and in Europe during the chaotic years of the plague. The machinations around the time of the three popes and what had to be done to decide who was the “rightful” heir to St. Peter were fascinating, as all three contenders and their retinues, numbering perhaps 100,000 people, descended on the small town of Constance in Germany to prove their legitimacy. Greenblatt explains what was necessary to copy manuscripts: finding and preparing vellum and ink, the scriptoriums that monks (primarily) labored in: cold, unlit, with no candles because of risk of fire, writing over previous manuscripts after scraping off as much ink as possible so they could re-use the vellum—and who knows what treasures were lost because of that practice? This book won the Pulitzer Prize for Nonfiction and the National Book Award. No surprise to me. Five stars! Than I or Than Me? Wondering What to Name Your Baby? If you don't use WordPress.com, enter your email address to follow this blog and receive notifications of new posts by email. WordThoughts · This WordPress.com site has to do with all aspects of words and language.